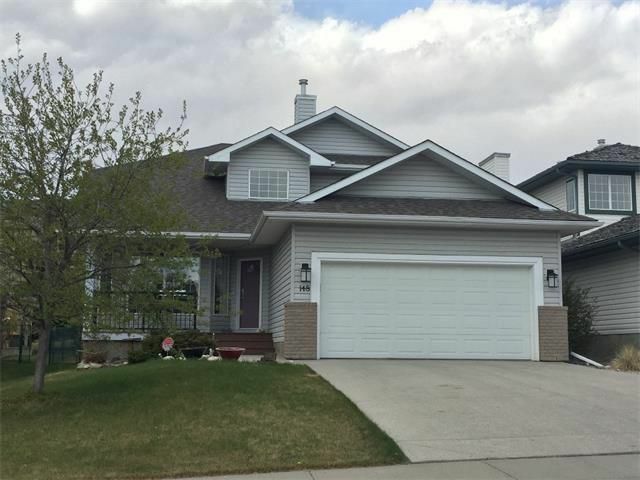 Welcome to 148 Gleneagles Close, a beautifully renovated 4 bedrm family home backing on golf course in desirable Cochrane. This immaculate home features a spacious open entry with cathedral ceilings and many upgrades, including completely reno'd kitchen w/ full height cabinets, granite counters & filtered water dispenser, all new master ensuite w/ heated floors & air jet tub, updated bathrooms w/ granite counters, rich hardwood flooring, multi zone under floor heat (all tiled areas + family rm & bedrm in basement), and the list goes on. Great family floorplan that offers space for everyone, including a main floor den, main flr laundry rm and an ideal MIL suite setup downstairs w/ full kitchen, full bath, family rm, bedrm, den & 2nd fireplace. Outside, there's a massive cedar deck & lush landscaping, no backyard neighbours & views of the Rockies. A new asphalt shingle roof, new composite porch decking and dbl attached garage round out this great package. All on a quiet street in a mature area. View today!